Relationships can be difficult. Surviving divorce is tough. Surviving divorce with kids is EVEN tougher! When you decide to marry someone you generally are full of hope, anticipation, and excitement at the prospect of getting married. Some people will marry and be blissfully happy for decades, others will muddle along with each other and some decide that they would be better off apart. Making that decision to part ways can be the hardest choice you will ever have to make. It might take week, months or even years of soul searching to decide to walk away. Your reason for leaving will be unique to your situation but the emotions that go along with it are similar to most people going through a divorce. The most important thing is to be gentle on yourself. This is a tough decision, but you will make the right choice. Give yourself time to heal and grow. Love yourself. You’re worth it! I got divorced in 2012 after being together for over 10 years and having 3 children together. I can honestly say that it was the worst time of my life. The roller-coaster of emotions, together with the complete change to my way of life left me a shattered mess. Many years later and I look back at the person I was back then and realize how much I have grown and become a different person. I’m stronger and more self-reliant now than I ever have been before. I have confidence in myself that I never had back then. Although I sometimes wish it hadn’t happened I am able to now to look back and see the benefits it brought to my life. You might feel alone and have no idea how you are going to survive this. I can tell you that you will survive and you will recover. 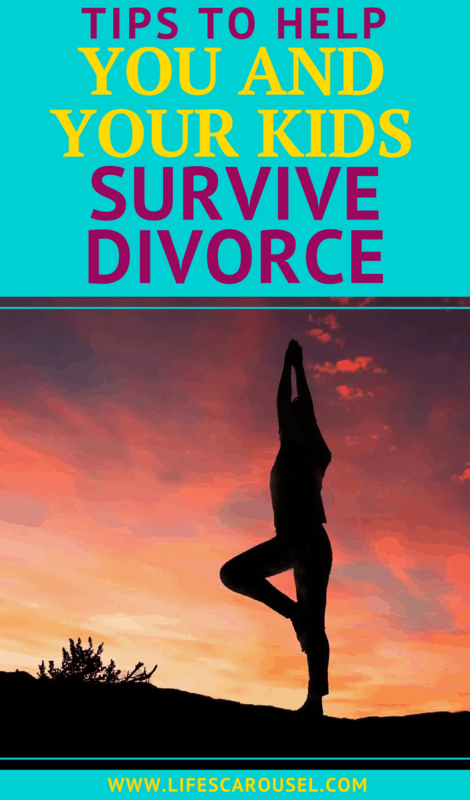 Surviving divorce is possible! Surviving divorce with kids is essential! When I was going through my divorce I would constantly beat myself up because I wasn’t able to keep up with the things I normally did. I didn’t cook nice meals for my kids. Forget about exercising. There was never any energy to do much more than the bare minimum. A friend of mine at the time told me to “be gentle on yourself. 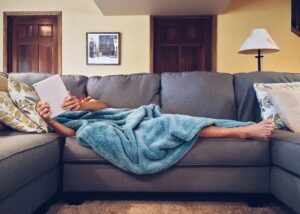 Treat yourself like you are getting over the flu.” Once I took that on-board it was easier to accept that things would get forgotten about, some things would go undone. But as long as I was making it through each day, then I was getting closer to being able to do those things again. With the best intention in the world, people will tell you to “get back out there” and start dating. And it’s relatively easy to start dating again with some many dating websites and apps… but please take it slow. You will make some bad choices and decisions because you are hurting and desperate to feel something other than pain. Let yourself heal. You might jump head-first into a new relationship and think that you have found true love again. The truth is that “oh so perfect” new relationship might just be a band-aid for your old one. Take the time to get to know yourself again, figure out what is important to you and what you really need from a new relationship. One of the absolute hardest aspects of divorce is seeing the effect on your children. Even years later I still have nightmares about those first few months. Nothing can prepare you for that. But they will survive, they will learn to cope and learn to accept it. My own parents separated when I was 12 years old, it took me a while but I adjusted and it didn’t make me sad anymore. When I look back now I can’t even imagine what life would have been like if my parents had stayed together. Now I realize that they were miserable together, but apart they were both able to find happiness again. I hope that one day my own children will look back and feel the same way. Without a doubt, I am a better mother to them now than I was before. I’m a better role model to my daughter and I show my sons how a woman expects to be treated. In the short term, it will be tough, and the only answer is lots of hugs, cuddles and “I love you”s. Be there for them, let them feel your love and that they are still the most important people in your world. Right now it’s probably difficult to even look at your former partner without feeling a boiling rage. Just hearing their name probably sets off an avalanche of feelings inside you. However, this too will pass and fade. You might never fully forgive them but you will learn that holding on to that pain and anger does nothing except eat you from the inside. You’ll probably never be their number one fan, but over time you will be able to appreciate their good points again. This is sort of a follow on from #4. You have a choice when a relationship ends – you can hold on to the rage and hate or you can let it go. For your children and for yourself… somehow find a way to let go of the hate. Continuing to fight over the same old things, again and again, will not bring you peace, it will prolong the pain for everyone. When we got divorced my ex-husband and I made a promise that we would stop hurting each other. We knew (from experience with our parents’ divorces) that if we fueled the flames that it would be our children that would suffer. For their sake, we decided to work things out as amicably. Yes, there were many many times that I wanted to be spiteful and make life difficult for him. But what good would that do? Revenge would make me feel better for a day or 2 but in the long run, I would suffer more. It wasn’t easy… in fact, it’s still not. When I felt like being spiteful I would make myself wait a few days before acting on it, and during that time I would calm down and see sense. So trust me, it’s worth making an effort now, your life will be more peaceful and less stressful in the long run. This is one piece of advice I didn’t follow and I wish I had done. When I first separated from my ex-husband I shut out my friends and family. I felt like a failure and I didn’t want their pity. I was determined to deal with it on my own. That was a mistake. For a few weeks my friends and family offered to help, but after I had refused so many times, they stopped asking. Life is difficult when you’re going through a divorce. You have more stress than you’re used to. Don’t be too proud to accept (or ask) for help. Your true friends will stick by you and want to help! This one is tough if you’re on a tight budget or tight on time (which you probably are), but it will really help. Divorce can stir all kinds of emotions and thoughts. We’re not always capable of understanding or coping with them on our own, but there is help. There are many different types of professional counselors and therapists. Take the time to find one that you click with. It won’t necessarily be the first one you go to see. I saw 3 different therapists after my divorce. The first two were very nice and knowledgeable, but they didn’t “get” me! I felt like it was a formal relationship. I didn’t relax and tell them what was really going on inside my head. Number three was… is… amazing! Even years later, I still see her once every month or two (it was weekly, to begin with), and it feels like talking to a close friend. It’s worth making the effort to find someone you connect with! You’re worth it! Divorce is tough. Surviving divorce with kids is tough. But I promise you… you can do this! Have faith in yourself and your ability to survive this. When you come out the other side you will be stronger and wiser. If you need advice or just someone to talk to, please feel free to email me at [email protected]. Reading your article is helping to prepare for what’s ahead. I’m glad you found it helpful. It is tough but with patience and love (for yourself) you will come out stronger and happier the other side.